I bought a pair of sports shoes to replace my comfortable old pair that was now wearing thin and crumbling at the sole. Although having planned on a modest budget, I ended up selecting a pair almost twice that amount, partly because they appeared to be most comfortable and partly because the saleswoman swore that they were cutting edge in terms of technology. Needless to say I came home as happy as a song. rather hesitatingly just minutes before departing for the airport. They were precious you see and I didn’t want to get their under-soles dirty. I almost had to remind myself that shoes were meant for walking not wrapping away in pristine white tissue paper. on prom night, but the joy was short lived. By the time we arrived at our hotel in Zurich, I was aching to take them off. I removed them silently, almost terrified to complain to my husband since I had championed the whole comfort story to buy them. As I peeled away my socks I saw deep red imprints of the criss crossing of the shoe laces embossed deep into the skin of my feet. The limp tongue of the shoe had failed to protect me from the rigid imprisonment of those harsh laces. and yet I had braved on and worn them all the way from Delhi to Zurich. With a deep sigh I sat on the edge of my bed not able to decide whether it was my heart that hurt more or my feet. This was the most expensive pair of shoes I had ever bought; and they hurt not only my pocket, but also my feet, my logical mind and my angry heart. This isn’t fair, I mumbled to myself. my mind contemplated a thousand revolts. I would sue the brand, write to their top boss, complain to customer care, argue my case with the brand store or worse still start an anti-brand campaign on Facebook. Endlessly the violence continued till sleep lulled the pain away. braced myself, wore my shoes (the only pair I had taken along in the quest for travelling light), trekked up a hill to the top of Zurich and back, hoping to conquer my frustration. But alas, on returning to the hotel and seeing the imprints on my feet yet again, a wave of anguish and anger surmounted my pain. in these shoes, I cried. I watched my anger swirling in my gut and then asked of it, what can you do now to ease the pain? With that question in mind I retired for the day and woke up next morning with a creative solution. 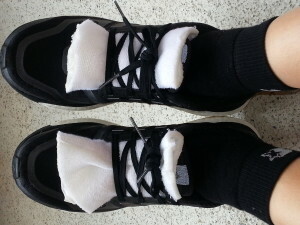 for the in room slippers, cut off their tops and inserted them over the tongue of my shoes under the laces. That would solve the problem, I beamed. Contented and definitely more comfortable, I showered, said my prayers and sat down to meditate. what are these shoes teaching me? And the Creator whispered… you are learning not to let niggling little pains, no matter how persistent they may be, hold you back from embracing the more meaningful and bigger joys of life. You can drown yourself in misery and complaints, amplify your pain and let it consume you or you can embrace it, accept it and ignore it. What you choose shall determine how you experience your journey on this trip. It can be hard to walk in your shoes or it can be enjoyable despite them. Joy or pain are choices you make. I felt something within me shift. Looking at my shoes, their toes curled up in a smile I wondered how I would walk in them – happy or miserable. I chose ‘happy’. I dressed, put on my shoes and stood tall in them. Looking down at them almost approvingly, I burst out laughing – those shoes looked really ugly, a black shoe in a white bandage, but I chose to pass them off as golf shoes. It’s OK, I muttered to myself, they’ll pass. those shoes on sweltering pavements and freezing glaciers. I’ve endured steep climbs and rolling meadows, I’ve run in them and also slipped and fallen on wet rain washed roads. The imprints on my feet still remain but they hurt less and honestly I am now less bothered, even indifferent. on the many Swiss trains, even felt envious in some cases but I’m happy wearing my shoes for the lesson they have served. My feet have adapted to the pain, maybe even surpassed it. I might still do what I deem right on my return to home base but while on this journey my ugly bandaged and uncomfortable shoes have taught me to savor the bigger, more precious joys of life and overlook the small troubles. They’ve even brought a smile to many a face who looked upon my shoes and wondered. and despite the shoes I feel happier, more joyful, more spontaneous, untiring and filled to the brim with Gods love and mostly because I embraced my lesson and chose joy over pain. I’ve learnt are choices we make along our journeys and depending on what we choose to put our attention to, eventually determines the experiences we attract and encounter. I chose happiness. I wonder about you. The story about your hi-tech shoes is a potent medicine that tastes like a Swiss Chocolate! Anyone who has read it must have surely connected with their personal experiences which life teaches us all the time. At least I did! The greatest lesson I have learnt “In whatsoever state I am, therewith I shall be content” Little hard but doable. I thoroughly enjoyed reading this.